Memoir and part travelogue, The Reluctant Tuscan written by Phil Doran will have you laughing out loud. What happens when the wife of a Hollywood writer buys a house in Tuscany that needs a bit of repair? And what if that house is in a small village filled with eccentric characters such as the neighbor lady that puts "the evil eye" on Phil and his wife Nancy? You get a hilarious slice of life in an Italian village that if you didn't know it were a true story you'd think it was a piece of great fiction! Nancy is a marble sculptor married to Phil, an aging Hollywood writer. To help her husband escape the rat race and fast paced life in L.A., Nancy buys a run down farmhouse that she thinks will be the answer to their need for a new life. Something that will save both Phil's life and their marriage. What Phil finds as he arrives in Italy, is a crumbling stone house unfit to live in and with no road to even get to it. As Phil and Nancy navigate the ancient & unspoken laws of small town life in Italy, turning neighbors into friends, you will meet some of the most interesting people, imagine the most beautiful landscapes and laugh at the things Phil & Nancy must do to "fit in", part of which will be discovering their "inner Italian". Phil Doran's writing is terrific and I'm glad he turned his pen towards his life in Italy. The book is entertaining, amusing and just plain fun. 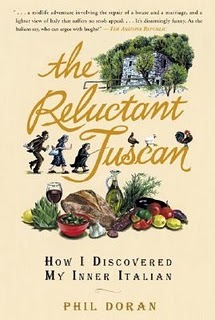 If you ever wanted to visit Italy, if you ever thought about renovating a house, and if you ever wanted to know what "extra virgin" olive oil really was, pick up The Reluctant Tuscan. Food, family and a sense of belonging are what you'll walk away with! That sounds delightful! I will have to keep an eye out for it! This really was such a fun read! One of my reading group members chose it, and we were all surprised at home much we all enjoyed it. The author has this great sense of humor and you just couldn't make up better characters! I definitely recommend putting this on a TBR list! Definitely want to know more. Sounds great. I have published my own book on living in Italy, English version available in a few months. The Sunday Salon... It's A Crime, "Literally"! Celebrate Read an E-Book Week!